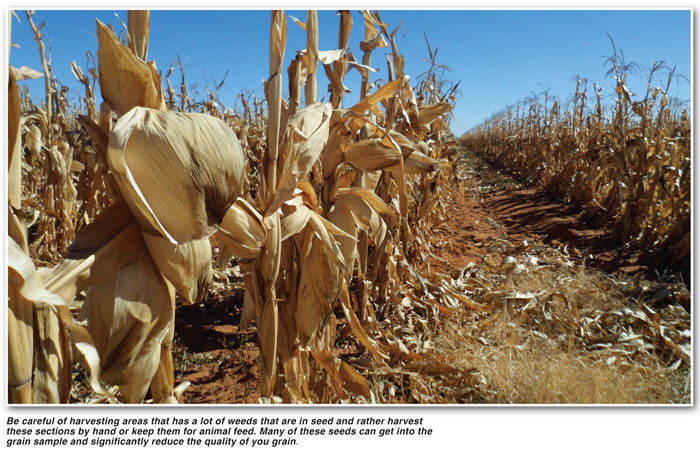 In this article I would like to outline a few essential management practices to keep in mind when it comes to maize production. As a maize producer you should have a goal of achieving the highest possible yield with the best possible quality grain. This does not always come easily as there are numerous challenges to deal with throughout the year. There are however a few simple management practices that you can put into place that can make this goal achievable. Many farmers are still in the process of harvesting their crop at this time. Harvest time should be a rewarding experience as you are now reaping the fruits of your labour. If, however you did not put the effort in during the growing season this will unfortunately not be the case. For the most part, not much more can be done at this stage to improve your crop or increase your yield. There are however a number of things that you as farmer have control over at this time which can improve the quality of grain flowing into the trailers and bags and also to a certain extent the quantity. First and foremost, you must make sure that your maize is at the correct moisture content before harvesting commences. Take a few samples before you get started and test the moisture content. Usually grain will only be accepted for storage at 14% moisture or less. This can vary from place to place depending on the market and facilities of the depot. Some grain storage facilities do have drying bunkers where your maize can be dried at an extra cost. Usually a deduction will be taken off the price that you receive. Make sure that your combine harvester is working optimally and not wasting grain. You can do this by checking the sieves and making sure everything is set correctly. Make sure that the grain is not breaking by setting the beaters correctly. The more broken kernels there are, the lower your grading will be on the grain. If there are lots of broken kernels in the grain sample this means that the machine is set too aggressive and needs to be adjusted. Avoid areas that are inundated by weeds that are in seed and rather harvest these sections by hand or keep them for animal feed. Many of these seeds can get into the grain sample and significantly reduce the quality of your grain. The market to which you are selling may even refuse to accept such maize or may request you to sieve it again costing you time and money. Be sure that your driver is properly trained. Whether you are using a tractor drawn combine or a self-driven combine it is essential that you or your driver is familiar with the machine that is being used. An untrained driver can lead to many tons being wasted due to trampling as well as a poorly set header. Finally make sure that all of your grain storage and grain carting equipment is in good condition. If there are gaps in the panelling or rusty holes in the metal you will have a lot of wastage. Even if there are small leaks make sure that they are patched up and closed properly. Every little bit adds up. By now all your harvesting should be complete. We will be awaiting the first spring rains and once again be getting ready for the next season. September should be a time of planning and preparation as well as a time for reflecting on the completed harvest season and working on ways to improve in the next one. 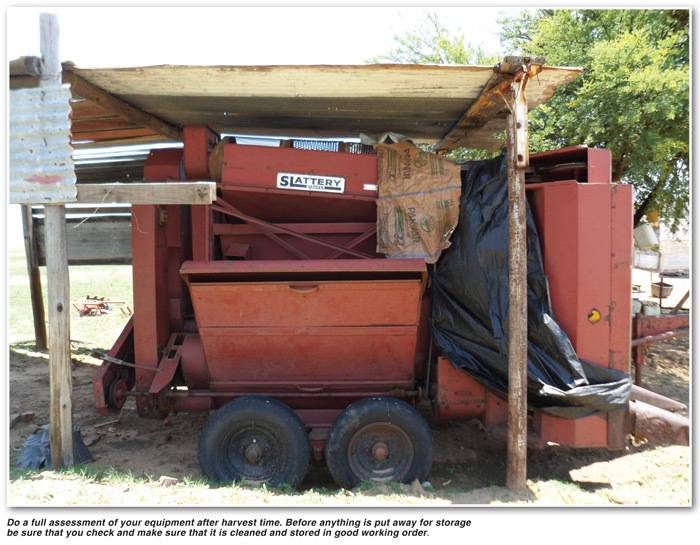 Do a full assessment of your equipment after harvest time. Before anything is put away for storage be sure that you check and make sure that it is cleaned and stored in good working order. Do a financial assessment of your business situation post-harvest. Write out a budget for the season to come and make the necessary financial arrangements to access the capital to plant again this year. Decide what crops you will be planting in which fields and draw a map for your own reference. Make sure that seed and fertiliser storage area is secure, clean and dry. Being a farmer is about getting into a good routine. You need to develop a system of planning that works for you personally and once you find a system that works, you should stick to it. Everything comes down to efficiency. If you put the effort in to achieve a smooth-running business you will most definitely see the results when it comes to harvest time.